Ukrainian troops on a KrAZ truck during training exercises near the western city of Lviv, 2015. Mike Vinik stands on the edge of his tug, Charles Oxman, preparing to cross to the houseboat he lives on outside of Perth Amboy, New Jersey. Protestors carrying a large "Black Lives Matter" sign cross in front of the LED American Flag in Times Square during the first night of protests against the decision not to indict Darren Wilson, the Ferguson police officer who shot Michael Brown, an unarmed 18-year-old. Anatoli Ovdeechook, 52, a Ukrainian fighter known as "Viking," shelters from the sun in a bunker overlooking the embattled southern city of Shyrokyne, Ukraine in July, 2015. Ukrainian soldiers line up before a training exercise near Lviv, Ukraine, led by members of the U.S. Army's 173rd Airborne. A protestor checks his phone next to steaming manhole covers in lower Manhattan on the first night of protests against a Missouri grand jury's decision not to indict the police officer who shot Mike Brown, an unarmed 18-year-old in Ferguson, Missouri. November 2014. Ukrainian soldiers dig a fighting position during a 48-hour "war games" exercise versus members of the U.S.'s 173rd Airborne at a military base outside of Lviv, Ukraine. Walter Serrano, a tugboat deckhand for Brown and Sons towing, crosses between barges while moving cargo in a small inlet by Red Hook. A member of the U.S. Army's 173rd Airborne holds a M-249 SAW rifle while waiting for an offensive by Ukrainian troops during a training mission at a military base outside of Lviv, Ukraine. July 2015. Mike Vinik, the owner operator of Vinik Marine, a tugboat business in the Tri-state area, looks out over the East River while on a night run delivering an oil barge to the Bronx to heat homes. A soldier in the U.S. Army 173rd Airborne waits for a training exercise to begin. He's taped an MRE bag over the ejection port of his rifle, as command wanted all soldiers to collect the blank shell casings they fired during the exercise. 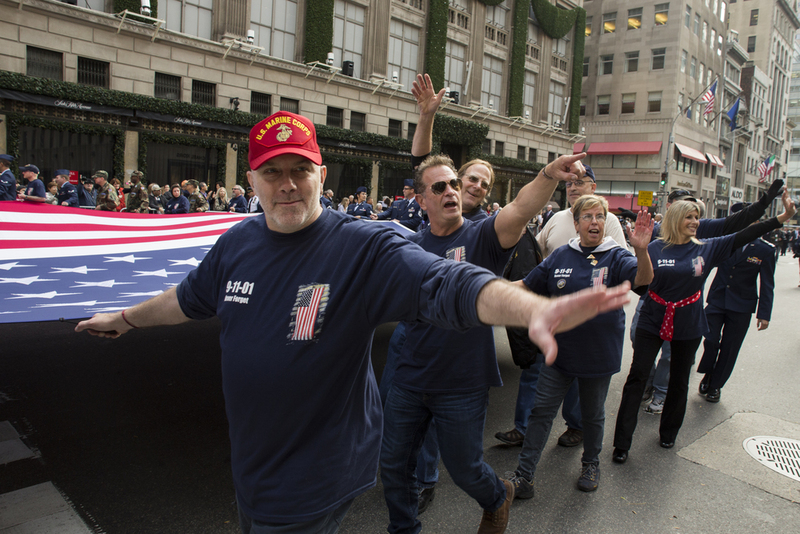 Firefighters carry a large American flag down 5th avenue during the 2015 Veterans' Day parade. Traders cross a shaft of light in the early hours of the morning on the corner of Wall Street near the New York Stock Exchange. Protestors March through lower Manhattan on the first night of protests against a grand jury's decision not to indict the officer who shot Mike Brown in Ferguson, Missouri. 2014. Kyiv's Maidan Square, where a wave of protests that began in late 2013 culminated in the removal of pro-Russian President Viktor Yanukovych and the subsequent Russian invasion of Crimea and the Donbass. July 2015.